It’s Purge night in America. Do you know where your weapons are? Or would you rather sacrifice yourself for a cult leader’s visions of greater glory? Preceded by a series of four moneymaking feature films (the latest released on this year’s Fourth of July), USA network’s The Purge is a weekly extension of a mayhem-driven invitation to imitative violence. It’s just what we don’t need during these increasingly fractious times. Namely, a new world order where any and all crimes, including murder, are legalized annually for a 12-hour period. The architect of both the movies and USA’s 10-episode series (Tuesday, Sept. 4th at 9 p.m. central) is James DeMonaco, who wrote and directed the first film in 2013 on a $3 million budget that led to gross receipts of $89 million. Each of the subsequent films made more money than its predecessor, prompting the latter day darker-minded USA network to dive in head-first. The first Purge film became a reality well before Donald Trump’s presidency. But the first episode of USA’s version ham-handedly wades into those waters during a posh “lockdown” party attended by the mostly rich true believers in The New Founding Fathers of America. “We’ve made America great!” proclaims hostess Ellie Stanton (Andrea Frankle) before attendees are given masks depicting various famous murderers who “paved the way” toward the “healing power” of lethal violence. An upwardly mobile young married couple, Jenna and Rick Bettencourt (Hannah Anderson, Colin Woodell), merely want to make a multi-million dollar deal with billionaire developer Albert Stanton (Reed Diamond), who’s also the party’s imperial host. But they also have an uncomfortable past with his saucy daughter, Lila (Lili Simmons). For reasons so far undisclosed in the three episodes made available for review, they previously joined forces in a sexual three-way. Now the Bettencourts fret that Lila might tell daddy. 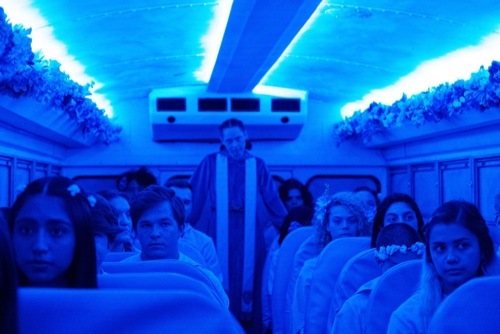 On an entirely different path are “Good Lady Tavis” (Fiona Dourif) and her blue bus full of acolytes in blue, hooded robes. On Purge night, her minions have all been persuaded to deliver themselves unto various gangs of weapons-wielding killers. Selections are made one at a time after a group-chant that goes like this: “Purify my flesh. Prepare my soul. The giving is near. The invisible awaits.” Those who have seen either Hulu’s The Handmaid’s Tale or HBO’s The Leftovers already know this basic drill. One of the Good Lady’s dupes, Penelope Guerrero (Jessica Garza), has an older brother, Miguel (Gabriel Chavarria), who’s desperate to save her after surviving overseas combat as a Marine. But he next must survive “The Gauntlet,” a televised kill-or-be-killed event in which the few who make it through are gifted with -- I’m not making this up -- a brand new car!!! A third storyline finds corporate executive Jane Barber (Amanda Warren) striving to close another big deal for Ryker More Equity. Jane and her team are protected on Purge night in a secured meeting room while the big boss, Don Ryker (William Baldwin), occasionally interjects via satellite. But as flashbacks show, Jane has some scores to settle with him -- and what better time than Purge night. But can she pull it off? The first three episodes occasionally flash some intrigue. But the acting is woefully pedestrian, and sometimes downright wooden, throughout all of the unsavory goings-on. The camera generally pulls away rather than graphically depicting some of the more violent sequences, which include one of the brainwashed blue-robed men beatifically awaiting redemption before being chopped to bits by masked ax-wielders. But even without copious blood-spattering, this entire enterprise is an assault on sensibilities in a period where real-life mass violence and warring factions are both multiplying and dividing. One wonders what on earth the “message” is here while worrying far more about whether The Purge’s increased exposure on a mainstream cable network will cause someone to “act out.” Even President Trump, in audio from a recent closed White House meeting with evangelicals, is predicting “violence” from the left if the mid-term elections result in major losses for the Republican Party. In that sense, The Purge comes to television at exactly the wrong time. Not that there’s really a right time. The fact that it’s also clumsily made and rife with mediocre performances seems almost beside the point in the context of how pointless this thing is in the first place. It’s neither a crime or misdemeanor for a television network to stoke such flames. But it is flatly irresponsible.